Thursday and Sunday's games are finally in the books! Let’s jump into Week 2 of Fantasy Football Wrap Up, where we’ll be reviewing the best and the worst fantasy performances from Thursday and all of Sunday's games, broken down by position. Tom Brady had himself a nice bounce-back game against a weak New Orleans Saints’ secondary, passing for 447 yards and 4 touchdowns with 0 turnovers. Brady also added 9 yards on the ground and ended the week as the highest scoring quarterback with 30.78 fantasy points in 4-point touchdown leagues. Carson Wentz was able to do what Brady couldn’t last week, which was throwing all over the Kansas City Chiefs. Wentz finished as the second-ranked quarterback, totalling 24.82 fantasy points, throwing for 333 yards, 2 touchdowns, 1 interception, and tallied on an impressive 55 yards on the ground. Andy Dalton failed to impress on Thursday night against the Texans, throwing for 224 yards and 0 touchdowns. Dalton added 5 rushing yards and only scored 9.46 fantasy points. So far this season he has a combined 6.46 fantasy points and has thrown 0 touchdowns and 4 interceptions. Cam Newton failed to record a touchdown this week, throwing for 228 yards and running for 27 yards. Newton finished as the 21st ranked QB in Week 2, totalling 11.82 fantasy points. Look for Newton to bounce back against the QB-friendly New Orleans Saints in Week 3. Broncos’ C.J. Anderson finished as Week 2’s highest scoring fantasy running back after a 30.40-point performance. Anderson carried the ball 25 times for 118 yards and a score, as well as hauling in 3 receptions for 36 yards and a touchdown. Anderson did it all for the Broncos’ offense, and if he can remain healthy this season, look for similar usage in the offense. Dual purpose running back Ty Montgomery took advantage of his matchup with the Falcons, carrying the ball 10 times for 35 yards and 1 touchdown. Ty Mont was used heavily as a receiver due to the injuries to teammates Jordy Nelson and Randall Cobb, acquiring 6 catches for 75 yards and a touchdown. Montgomery finished Week 2 with 30.00 fantasy points, which was second out of all running backs. When you draft your running backs in fantasy football early, you need them to deliver. On Sunday, DeMarco Murray and Ezekiel Elliott disappointed fantasy owners, scoring a combined 10.00 fantasy points between them. Whether the Titans rested Murray due to a blowout of their opponent, or if they were riding the “hot hand” is yet to be seen. 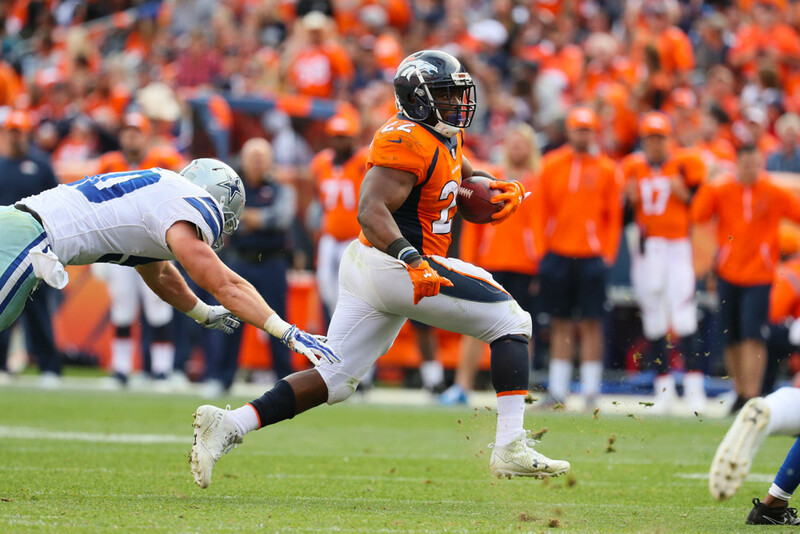 Murray had 25 yards on 9 carries and 3 yards on one catch, resulting in 3.80 fantasy points. Elliott only ran the ball 9 times for 8 yards and caught 4 passes for 14 yards, totalling 6.20 fantasy points in full-PPR leagues. Michael Crabtree continued to show why he is Derek Carr’s favorite receiver in the red zone, catching all 6 of his targets for 80 yards and 3 touchdowns, scoring 32.00 fantasy points. Likewise, in a shootout at Mile High, Denver Broncos’ Emmanuel Sanders amassed an impressive 24.20 fantasy points this week, after catching 6 of 8 targets for 62 yards and 2 touchdowns. These receivers were both drafted after the 4th round of drafts and are already returning value this season. After a huge Week 1 on Monday night, Stefon Diggs was limited by the Steelers to only 4.70 fantasy points, catching 2 of 6 targets for 27 yards and 0 touchdowns. This was to be somewhat expected after it was announced early Sunday that Sam Bradford would sit out due to an injury and Case Keenum would get the starting nod. Arizona Cardinals’ Larry Fitzgerald was only able to haul in 3 of 6 targets for 21 yards against a weak Indianapolis Colts defense. Fitzgerald finished the day with 5.10 fantasy points and took a backseat to teammate J.J. Nelson who had 23.00 fantasy points on the day. The highest scoring tight end in full-point PPR leagues this week was Chiefs’ Travis Kelce who hauled in 8 of 10 targets for 103 yards and 1 touchdown. Kelce tallied a total of 24.30 fantasy points. Patriots’ Rob Gronkowski reminded everyone just how good he can be, catching 6 of his 9 targets for 116 yards and 1 touchdown, good for 23.60 fantasy points. When healthy, Gronk is a serious mismatch against covering linebackers or safeties. Those who started Jimmy Graham this week surely didn’t think his production could’ve been worse than in Week 1 where he only scored 1.80 fantasy points. They were wrong. Graham only had 1 reception for a grand total of 1 yard, for 1.10 fantasy points. Charles Clay only had 3 targets this week, compared to 9 a week ago, and only had 23 yards 4.3 fantasy points. Honourable mention to the Falcons’ Austin Hooper who, like last week, received 2 targets this week, but only managed 7 yards for 2.70 fantasy points. A healthy Tampa Bay Buccaneers Defense began their season and beat up on Mike Glennon and a depleted Chicago Bears offense, on route to accumulating 1 sack, 2 interceptions (one resulting in a pick-six), 2 fumble recoveries and only 7 points allowed. The Bucs finished the week as the 1st ranked defense with 19.00 fantasy points. For the second week in a row, the Baltimore Ravens Defense was impressive yet again against another AFC North opponent, the Cleveland Browns. The Ravens only allowed 10 points against, and finished with 3 sacks, 4 interceptions, and 1 fumble recovery, for a total of 17.00 points this week. The highest scoring kicker from this past week with 15.00 points was Cody Parkey from the Miami Dolphins, who scored 13 out of their 19 points on Sunday. Parkey completed his lone PAT and hit field goals from 28, 30, 35, and 54 yards out. Pittsburgh Steelers’ Chris Boswell was able to rebound from a 3.00-point performance last week, converting a total of 4 field goals from 29, 37, 43, and 46, yards and added 2 extra points for 14.00 points. Falcons’ Matt Bryant made 4 PATs and kicked 2 field goals from 51 and 53 yards, also scoring 14.00 fantasy points this week.